and dubs the plasma and lasser upgrade off the mecha. This version takes scrin,traveler,reapers air off them apart from their MCV and also takes the corrupter and the plasma disk and lasser upgrade for mecha. Nice. Is this the map mine had a similair style to? lol. You ruined my streak in the map archive, all the maps for along stretch were mine. You seem to put alot more effort into your maps thean I do, some maps I can spend no more than 45 minutes on. 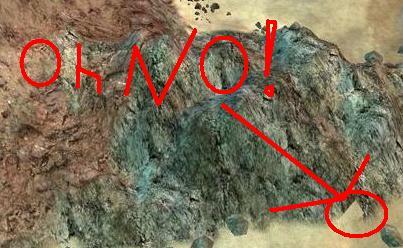 I noticed you missed a texture blend on the thir pic down on the rock cliff between the grey and and the sand. have been done like a pro,btw other people make maps,i've just been very lazy as i got exams. city scape maybe a good one to start my skills at. what about this single tile? i don't really see the problem,as most maps are'nt done to be map to look good, only for new options to play like blood area and commando wars. lol, I reread what you wrote, I didn't see the "not" the first time. I thought you said " all textures blend perfectly". My bad.